I finally got back in the woods after spending all of DEC on the road. Had to wait for the monsoon in missouri to stop, but was able to spend 3 days in the woods rather than 6. Water was way way up. Closed some spots I really wanted to try. But I was having fun trying new things. Saw plenty of deer but nothing ever closer than 50 yards and never clear. Thursday afternoon was going to be my last pm sit and maybe last sit in mo as momma wanted me home for new years. I was going back to a place my brother calls whack a mole, cause deer always pop up and I always whack one... Lol. Well I get there and two vehicles in the parking lot. Well there is too much ground to crowd somebody so I moved on. I recalled a spot my brother showed me a few years previous that he had had some luck on, and I headed out, already resigned to the fact I was going home empty handed. Had a heart to heart with myself and decided empty handed or not I was going to enjoy this awesome evening in Gods woods. Well, sure enough at 345 here come a bachelor group... Of 3 button bucks. The lead dude looked like he would fit perfect in the little spot in my freezer, so when he stepped out at 11 yards I drilled him. 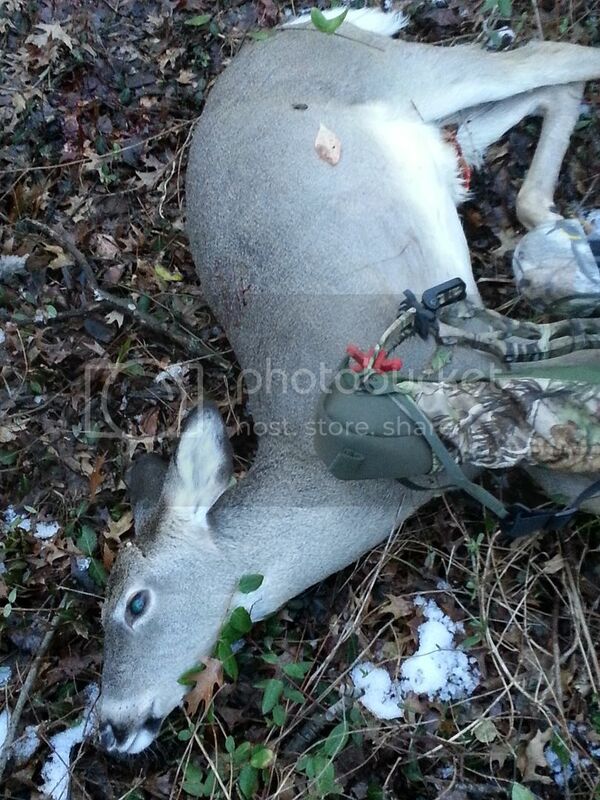 He ran 3 circles and died at 35 yards from the tree. I sat there for another hour and saw 3 more that stayed just out of range, got down, collected my stuff, and my prize, and made my way back to the truck. I told my brother that this had been a pretty dang good late season hunt even if out was cut short by the wx. We have spent 10 days before in the late season and never seen a hair. Still got a little time left in Arkansas... Just have to find out how far my lease is under water. Good luck to those still after it and enjoy the woods!! Nice going!!! New is going to be jealous of all those 'button's' you're seeing...and even more so of the one you got. Nice going and good shooting! Thanks all!! Very tender and very tasty!! Nice job, what kind of bow did you take it with? I currently shoot a 2011 bowmadness xl. It has 70# limbs but I have it backed off to 55 right now til I can get back to normal.